MIQUELA SOUSA, aka Lil Miquela, is a 19-year-old It girl, influencer and singer from California, with 1.3 million followers on Instagram (@lilmiquela). Rocking space buns, a micro fringe and a peppering of pretty freckles, she wears clothes by the likes of Chanel, Supreme and Vetements. Prada invited her to take over its Instagram account during one of its Milan shows and she has appeared on the cover of magazines such as Wonderland. She frequently posts across her Twitter, Facebook and Tumblr accounts, and Time magazine named her as one of 2018’s 25 most influential people on the internet. The catch? Miquela doesn’t exist — at least not in the traditional ‘flesh and blood’ sense. She’s a CGI princess who lives in a virtual universe (which happens to look an awful lot like ours). And in our world, where it frequently feels like Black Mirror doesn’t quite go far enough, she’s at the forefront of a new wave of AI influencers. When she launched on the social media scene in 2016, many of her followers failed to clock that she wasn’t real. Even those who did were baffled about where she came from. She was the subject of numerous conspiracy theories until this April, when it became apparent that LA start-up Brud were the team behind her. While their machinations remain secretive, Brud also seem to have created fellow virtual influencers Bermuda (@bermudaisbae) and Blawko (@blawko22). In a PR stunt, Brud concocted a Westworld-style storyline in which Miquela found out she was a ‘robot’ — not a human, as she had always believed — and temporarily fell out with the company. Nowadays, some influencers wield more power than Hollywood stars. Their capacity to rake in the cash via endorsement deals and brand collaborations is vast. The relatively simple CGI technology needed to create the likes of Lil Miquela’s Instagram posts, in which she sometimes poses with real-life figures such as Nile Rodgers, has been around for a decade. But by creating an influencer they can control in every regard, Brud have cottoned on to a highly lucrative concept. It’s perhaps no surprise, therefore, that they are widely suspected to be backed by various major venture capitalists in Silicon Valley. Nevertheless, partnerships with AI influencers look set to become increasingly popular for big brands. Coca-Cola, for example, has struck a deal with virtual character Alex Hunter from the Fifa video game franchise. 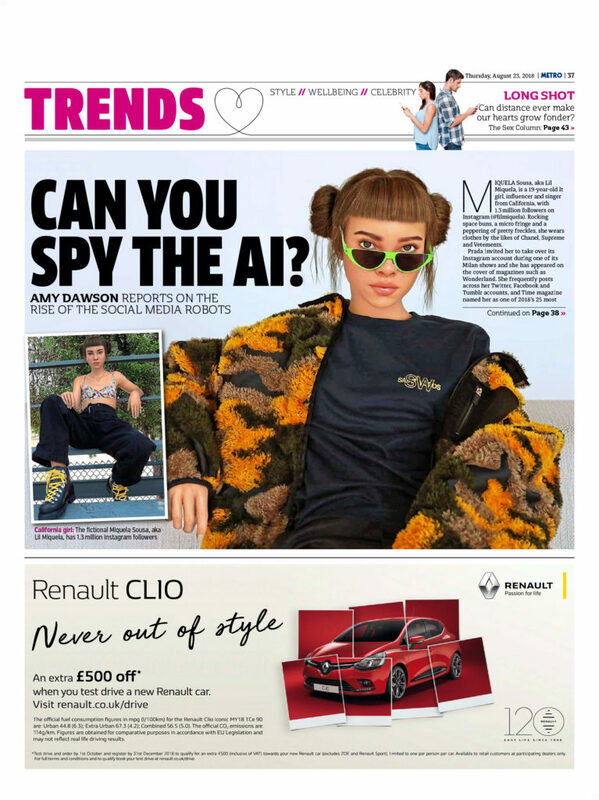 ‘From a brand perspective, AI influencers offer the same level of engagement as human influencers but come with the added guarantee that they can’t go rogue,’ says Samuel. An AI influencer will never go off-message and can be manipulated to do exactly what a sponsor wants. Yet Lil Miquela’s feed isn’t just about convoluted plot-lines and flogging fashion and lifestyle content. Her platform is used to support various worthwhile causes, including Black Lives Matter and Planned Parenthood. However, her virtual ‘frenemy’ Bermuda is a pro-Trump advocate who denies climate change. Their opposing views are all part of the simulacrum developed by Brud. Yet at a point when the power of social media to sway voters is under scrutiny, imbuing fake influencers with political opinions is potentially flammable. Furthermore, it’s worth questioning how AI influencers could impact on the psychology of their followers. Of course we could say that all influencers in some way present a selectively curated and unrealistically idealised picture of their lives. But when our role models are CGI, couldn’t the standards of unobtainable ‘perfection’ become dangerously high? Whatever the future holds for Lil Miquela and co, they are likely to be the tip of the iceberg. It’s a brave, fascinating and slightly scary new world out there, so scroll and type carefully, and hold on to your CGI hats. Metro contacted Brud about the points raised in this article but did not receive a reply.